Heading into this Saturday’s 14th round of the 2014 Monster Energy Supercross Championship at NRG Stadium in Houston, all eyes were on Yoshimura Suzuki’s James Stewart. The Floridan took his fifth win of the season last week at St. Louis Supercross, which was also the 50th victory of his 450SX career. Due to his performances, he was able to gain some ground on the overall leader, three-time AMA Supercross Champion Ryan Villopoto (Monster Energy Kawasaki KX-F450F; following St. Louis Supercross, Stewart was 36 points off the top. But the scenario changed once again in Houston when Villopoto dominated the 20-lap main event, taking his fourth win of 2014 SX. He was joined on the podium by Team Honda Muscle Milk’s Justin Barcia and Red Bull KTM’s Ken Roczen, respectively. As for Stewart, he was battling an illness, and didn’t have the best performance. When the 41st Supercross visit to Houston began, Villopoto, who suffered a hard crash in his heat race – took the Nuclear Cowboyz Holeshot before nearly 50,000 fans. Title contender Ryan Dungey ended up crashing during the opening lap, as Stewart struggled to stay within the top five. As Villopoto opened a gap, Barcia and Roczen took the second and third positions, respectively. All three would remain in these positions for the remainder of the race, never challenged. Villopoto took a wire-to-wire win, which was also his fourth-straight race win in Houston. Team Honda Muscle Milk’s Honda finished fourth, and Stewart would earn fifth, allowing him to slip into second in the point standings. With three rounds remaining, Stewart now trails Villopoto by 45 points. Dungey regained his rhythm to pass 11 riders after his opening-lap crash, and finished seventh. He is now third in points, 46 points behind Villopoto. In the return of the Western Regional 250SX Class Championship for its seventh race of the 2014 season, Rockstar Energy Racing’s Jason Anderson captured his fourth win of the season to extend his points lead. Troy Lee Designs/Lucas Oil Honda’s Jessy Nelson started the 15-lap 250SX Class Main Event by grabbing the Nuclear Cowboyz Holeshot Award with Anderson and Monster Energy/Pro Circuit/Kawasaki’s Justin Hill in tow, Feld Motor Sports says. Anderson made a pass for the lead by the time the field entered the second corner and opened a gap. Hill and his Monster Energy/Pro Circuit/Kawasaki teammate Dean Wilson followed suit and took over second and third, with Wilson making the pass on Hill and setting his sights on Anderson out front. On Lap 4, Hill crashed in the whoops, giving up the spot to Troy Lee Designs/MAVTV Honda’s Malcolm Stewart, Feld Motor Sports says. Anderson maintained about a two-second margin for the bulk of the race, until Wilson started closing in as they approached lappers. 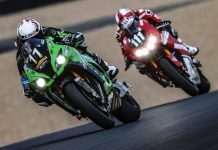 Wilson put on the pressure over the final two laps, with mere bike lengths separating the two, but was unable to make a pass happen before the finish, Feld Motor Sports says. It was the first Western Regional 250SX Class Championship race since the San Diego stop on February 8. Wilson overcame a dislocated shoulder suffered in a crash during his Heat Race to finish second and grab his third podium in four races, while Stewart posted the third podium result of his career in third. Anderson’s main challenger in the Western Regional Championship standings, Cole Seely, finished fourth aboard his Troy Lee Designs/Lucas Oil Honda, Feld Motor Sports says. Anderson’s lead over Seely in the championship now sits at 11 points with two races remaining in the Western Regional 250SX Class Championship. Monster Energy Supercross heads to Seattle’s CenturyLink Field next Saturday, April 12, for the 15th race of the 2014 season. Live broadcast coverage on FOX Sports 1 begins at 10:30 p.m. ET.